All too often the lethal lovelies of spydom are ignored so I thought they should have their own page. Ah, dearest Emma... Sorry, this isn't an Avengers LP. Please go to the T.V. Spies page for music to "The Avengers". "Honey West" (1965-66) played by Anne Francis was first introduced on an episode of "Burke's Law" (Who Killed The Jackpot) in 1965. While technically a private detective, her martini olive radio transmitters, secret office behind a fake living room wall, specially modified lipstick tubes, and pet ocelot, earn her mention here. The album has a catchy theme by Mullendore and it's on a Harkit label CD! "Operation Lady Chaplin" (1966) was one of the many spy films Daniela Bianchi appeared in. The theme was performed by Bobby Solo, the "Italian Elvis" and was released on 45 only in Europe and Brazil. Is it odd to have a crush on a puppet? Lady Penelope Creighton Ward was the elegant and sophisticated secret agent who along with her butler and a lethal pink Rolls Royce helped the International Rescue team save the world on TV's "Thunderbirds" (1964-66). 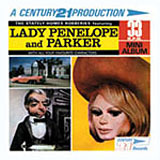 The "Thunderbirds" theme as well as the incredible "Parker, Well Done" can be found on several collections both on LP and CD. Silva Screen has released two CDs of music from the T.V. show. 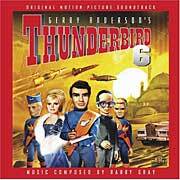 "Thunderbirds Are Go" (1966) and "Thunderbird Six" (1968) were feature films, both with scores on CD. There have been a few incarnations of the "Thunderbirds Are Go" soundtrack, but the one to look is a CD with four additional songs by the Shadows from a rare EP that includes "Shooting Star" with Cliff Richard (he sang it in the film). "Fanderson", the official Gerry Anderson fan club has put out a number of great albums over the years. This 7-inch has a nine-minute suite of music from "Thunderbird Six". 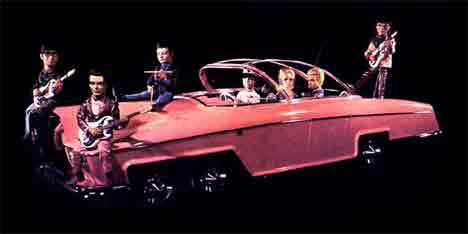 Their fantastic CD of music from "Supercar" and "Fireball XL5" has music later used in "Thunderbirds" and other Supermarionation series. Century 21 produced a number of 7-inch records of music and adventures in the 60's. Most were adapted from the TV show, but "F.A.B." was an original story with Penny and Parker in the Himalayas investigating the Abominable Snowman. (Check the great "Fanderson" website as they have a number of these available on CD now). 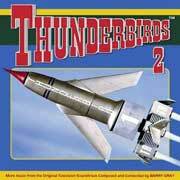 The score to the live action "Thunderbirds" by Hans Zimmer is available, ...but don't bother. FOREIGN INTRIGUE / KEEP ME COVERED / SINGLES / WHAT'S NEW?